This summer the Pontifical Biblical Commission (PBC) published a new document on the inspiration and truth of Sacred Scripture. I waited eagerly for the English version which I finally received last week and read it that same evening. I will probably have a few comments on this new document, but for now it seems very appropriate to present it to you with the words of Fr. Klemens Stock, SJ, the PBC’s exiting secretary. This presentation is not part of the PBC's document, but it was written for the bulletin of the Pontifical Biblical Institute. What follows is my translation from the original Italian. The text is organized in three parts: Inspiration, Truth and some challenges for the interpretation of the Bible. The starting point of this survey is the teaching of the dogmatic constitution Dei Verbum from the Second Vatican Council. The document seeks to show how the same biblical texts bear witness about their own inspiration and truth, while considering necessary to limit the study to a representative selection of these writings. Given that only two passages (2 Tim 3:16; 2 Pet 1:20-21) talk explicitly about divine inspiration, the research guiding question is: What do these texts say about their divine provenance and the relationship of their authors with God? The Old Testament attests, for example, Moses and the prophets’ calling and the fact that they receive from God the instructions they must communicate, both orally and in writing to the people (Exod 24:4; 34:27; Deut 31:9). In the New Testament the relationship of the authors with God occurs always, whether immediate or mediate, through the person of Jesus. Paul affirms his encounter with the risen Jesus (1 Cor 9:1; 15:7) and considers it a gift (grace) from the Father (Gal 1:15-16). The author of the fourth Gospel attests his own contemplation of the Only Son’s glory (John 1:14) and presents himself as an eyewitness (John 19:35; 21:24), instructed and guided by the Spirit of truth, who is sent by the glorified Jesus (John 15:26; 16:13). However, the relationship of the author of the Gospel of Luke and with the author of the Letter to the Hebrews is mediated. The first one is based on the “eyewitnesses and servants of the word” (Luke 1:2); the second one on the witnesses who heard the announcement of the Lord (Heb 2:3). 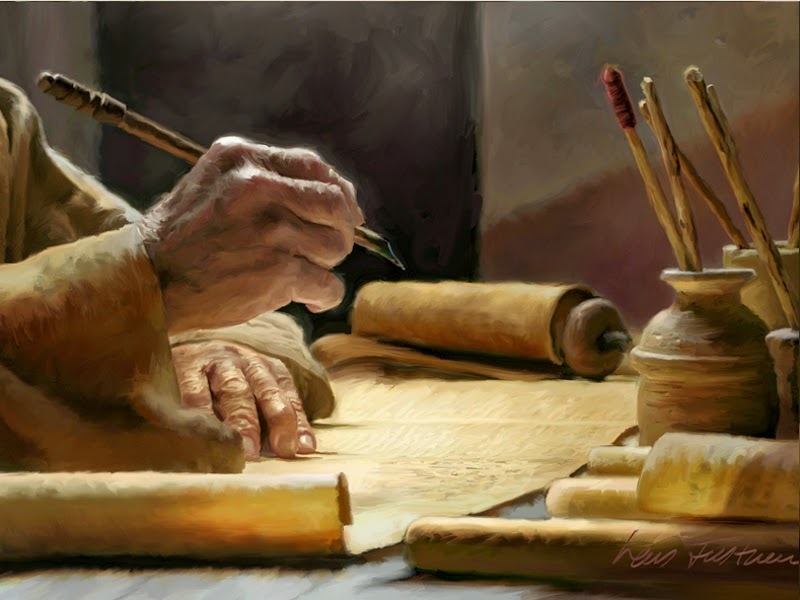 The biblical writings show in many ways the relationship of their authors with God (OT) through Jesus (NT), but they do not mention a particular divine assistance benefited by the authors while in writing (inspiration in the strict sense). The truth that is at the center of the divine revelation concerns God himself and human salvation and is revealed in its fullness in Christ (DV 2, 11). Sacred Scripture is not interested in any subject but in communicating this truth. The reading which corresponds to the finality of Sacred Scripture is the one which looks in itself the knowledge of God and of his salvation. This fullness of truth cannot be found in a restricted reading of single and isolated writings, but only in a “canonical” reading in the light that is the person of Jesus. The document presents, through a selection of passages in both Testaments, the truth that they manifest. Based on Matt 28:18-20, the culmination of the revelation of the truth about God and his salvation may be expressed as: Jesus reveals God who is Father, Son and Holy Spirit, who is the fullness of communion of life in himself, and who offers as salvation to humanity the sharing in his communion of life. As way of example, the document deals with some biblical passages that appear problematic from either a historical, ethic or social point of view. Regarding if it actually happened, from the OT, the covenant with Abraham (Gen 15), the crossing of the sea (Exod 14), the books of Tobit and Jonah, and from the NT, the infancy narratives, Jesus’ miracles and the resurrection narratives are taken into account in the document. The vow to the extermination of the inhabitants of the land of Canaan (cf. Deut 7:1-2; Josh 6-12), the prayer to God asking for vengeance (cf. Ps 109) that appear as practices totally opposed to Jesus’ teaching are considered here too. Also presented as problematic is the social disposition (statute) concerning women described in some NT texts (Col 3:18; Eph 5:22-23; Titus 2:5). For the consideration of these biblical passages we refer you to the document. Later on I hope to come back with a review of this PBC’s document. From Vinea Electa. Bolletino informativo dell’Associazione ex-alunni/e del Pontificio Istituto Biblico, num. 14, anno 2014, 22-23. Is this document available free on the web, or do I have to buy it ? Chris, I asked Juan Miguel yesterday and he said he had to buy the document at Amazon at this point. I keep hoping to find it for free online too!